So today, after much messing around with XAML, I finished off the basic features of my Windows 8 app. I call it BeCharming, a play on the name of the Charms Bar. The app itself is very simple. It consists of a Windows 8 Metro Style app that creates a Share Target for all types of media. The second part of the app is a simple listener. You install this on all the machines you want to share to. This includes all PCs that work with the .Net framework, so it will work with Windows 7 and Windows XP. 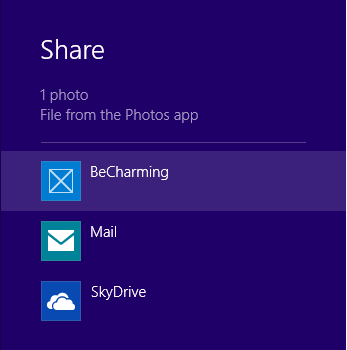 When you open the Share charm on any Metro Style app, you’ll be presented with BeCharming as a share target. 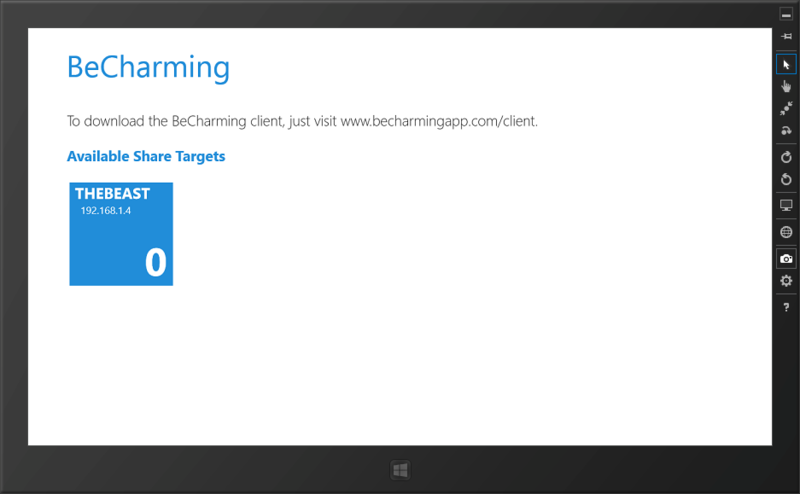 This will open the BeCharming app, letting you choose the target machine. Hitting Share will transmit the data to the target machine and open the file. There are a few scenarios where I think this will be very useful. I’ve got a little clean-up of the code to do, including making it work in snap-view. I also need a logo designed. Once those bits are done, I’ll be submitting to the Windows Store for approval. There are some potential security holes with this basic edition, but it’s designed for internal use e.g. at home, between your machines and maybe at work. I have a few ideas to improve the basic security, but this is a basic MVP to start with. If any Windows 8 developers want to give this a try and kick the tyres, please drop me an email at tomas@tomasmcguinness or hit me up on http://www.twitter.com/tomasmcguinness and I’ll get the client to you as quickly as I can! I’d love to get some feedback.